We collaborate with Kings College London (KCL) to provide essential teaching for those responsible for counselling around antenatal and newborn screening. 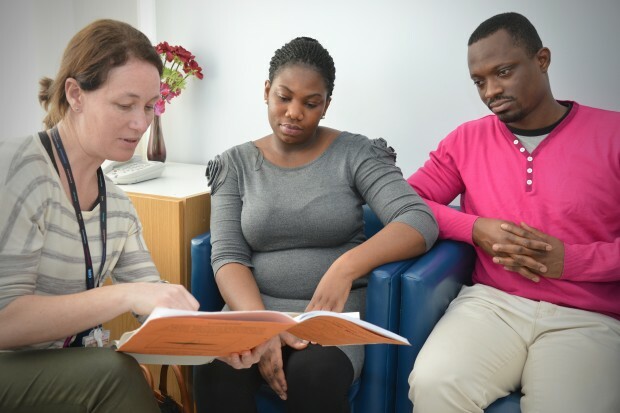 The courses, which are accredited by the Royal College of Midwives, are particularly valuable for staff caring for people affected by sickle cell disease or thalassemia, which are inherited genetic disorders known as haemoglobinopathies. Funded places for eligible professionals are available on the one-day haemoglobinopathies short counselling course. To register please contact King’s College London directly. Please note there are still places available on the next course on 10 November 2016 in London. Bursaries are available for the 4-day genetic risk assessment and counselling module. Please note that the bursaries are for course fees only. The confidence and credibility of practitioners responsible for screening and counselling is improved by a deeper understanding of haemoglobinopathies and how they affect societies. Previous participants on the haemoglobinopathies short counselling course described the speakers as responsive, informative, knowledgeable, passionate and inspirational. Fantastic event, interesting and motivating. Participants on the genetic risk assessment and counselling module said they gained a deeper understanding of the scientific and clinical aspects of the conditions as well as the cultural and social issues which surround them. They said this helped with the interpretation of complex results and the development of counselling skills. All said they would encourage colleagues to attend. Inspiring to be taught by active practitioners who have been so influential in the development of the haemoglobinopathy screening programme. For more information about both courses and an application for a bursary to undertake the Genetic Risk Assessment and Counselling Module please see the screening CPD website. The next dates for the one-day short counselling course are 10 November 2016 (London) and 25 April 2017 (Birmingham). The next dates for the 4-day genetic risk assessment and counselling module, held in London, are 11 to 12 May and 15 to 16 June 2017.
how do i get on the one day short counselling course for 10/11/16? KCL is having temporary problems with its online booking process. In the short term you can email the PHE Screening helpdesk at PHE.screeninghelpdesk@nhs.net and we will send you a study day application form to complete and return to studydays@kcl.ac.uk. Hi Catherine, thanks for letting us know. I have removed the links from the blog temporarily and will reinstate them when KCL has resolved the issue with the links to the courses on its website.